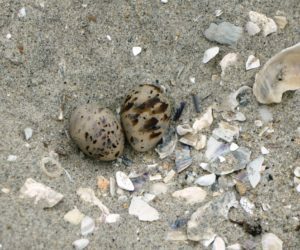 California lest tern nest decorated with shells. The markings on the right egg are rare. 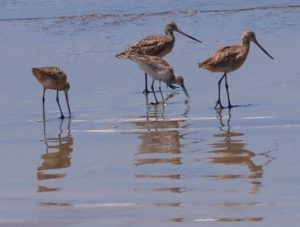 The SDZ Pacific Coast Birds Conservation Program is working with partners to support the recovery of declining coastal birds. Development of successful conservation strategies requires timely and accurate information about current population trends, habitat conditions, and environmental drivers. We strive to identify key knowledge gaps, and to develop evidence-based recommendations and adaptive management strategies to increase the impact of beneficial actions and to reduce the drivers that hamper conservation efforts. 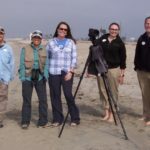 Using an ecosystem approach, our field and lab teams combine research, management, and outreach to support endangered and threatened avian populations along the coast. For example, we currently conduct environmental surveys that focus on the California Least Tern and Western Snowy Plover. These surveys include nest monitoring, banding, tracking chick growth, monitoring predators, implementing habitat management strategies, conducting behavioral observations (including foraging studies), and opportunistic sampling (necropsies, genetics, and toxicology analyses). Our collaborative research aids in answering questions regarding dispersal (where are the birds going, and why? ), breeding ecology (what do they need to successfully reproduce? ), and population health (how are they doing overall, and how are they affected by environmental changes?). We also conduct surveys to monitor predation, survival rates, and causes of mortality in order to develop better management methods. Coastal populations are impacted by climate change, at sea, and on land. for training purposes to aid in identification. 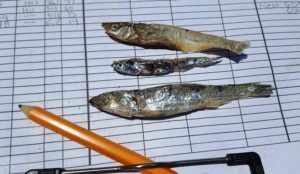 As an example of some of our research activities, foraging studies of California Least Terns have been included recently into our research methods to gain insight into the changing diets of chicks. By monitoring individual tern nests from a safe distance, field biologists observe the species of fish being fed to chicks, the periodicity of feeding cycles, and food provisioning between chicks within the same nest. In combination with egg measurements, chick growth studies, and studies of potential causes of mortality (e.g., necropsies), researchers can learn about how foraging conditions may influence productivity. These studies have implications for tracking changes in tern diet over time, and whether terns are being adversely affected by climate change. In the future, we are excited at the prospect of new research methods to facilitate our studies, such as being able to track foraging distance (e.g., GPS units), investigating habitat and vegetation preferences, and determining suitable habitat variables, including monitoring ocean conditions. There are also opportunities to learn more about these important species with respect to genetics, migration, toxicology, and changing marine environments and food webs. We are in the process of building our website: please check back soon for more updates into our conservation projects for birds along the Pacific Coast!